The name “Tammany Hall” has long been synonymous with urban political sleaze, personified by fatcat Boss Tweed. Yet during the halcyon days of the Tammany Hall political machine, New York City was transformed into a leading international city. In his 2014 book, Machine Made, Terry Golway highlights some of the great New York political leaders originally schooled in Tammany saloons and questions whether Tammany has been treated fairly by history. Skeptical going into the book, I soon found that my view of Tammany as an all-powerful, corrupt force had been overly monolithic. Tammany was a major force for about a century, but even in its prime, Tammany was routinely swept out of power when its shenanigans became too much for the public to handle. Through this century, some elements remained constant: Tammany’s reliance on an Irish political base, exemplary record of constituent services, and shady relationships. On the hand, as New York City matured, more was asked of its defacto Democratic Party, and its role in advancing both Progressive Era and proto-New Deal legislation is undeniable. The Tammany Society (named for Tamanend, a Lenape chief) was founded in the 1780s, but its story truly began in the 1840s, when waves of Irish immigrants fleeing the potato famine completely altered the demographics of New York City and upended its politics. Like future immigrant waves, these Irish were treated poorly and written about disparagingly. Tammany leaders had also shown them little interest until their numbers become unavoidable; by the mid-1850s, one in four New Yorkers had been born in Ireland. Tammany cultivated this vote. I found these early chapters, which are long on intra-Irish squabbles, pretty unmemorable until the arrival of Bill Tweed. William “Boss” Tweed, for all of his scoundrel, will endure through history thanks to the Thomas Nast cartoon in which he is depicted as the archetypal political fatcat. The man who bilked the City for millions of dollars and ruled state government was brought down by a New York Times expose that shocked the City’s conscience. Even Golway doesn’t do much to suggest any upside to Tweed’s character, yet our Department of Education building is still named for him. I had forgotten before reading Machine Made that for all of the hype, Tweed’s career was as long as a NBA basketball player. He held power for about 15 years, but absolute power for only about four, ultimately spending more time in jail than he did on top of the heap, a rare anti-corruption success story. Tammany had many enemies, but no nemesis that irritated it more than “reformers.” (In George Washington Plunkett’s quasi-memoir, Plunkett of Tammany Hall, his vitriol towards Citizens Union is second to none, which would surprise people familiar with the genteel non-profit that survives to this day.) The reformers were snobbish (at one point toying with the end of universal male suffrage), rich, and sanctimonious, but they also won a decent number of elections. Their alliance with the temperance movement is hard to analogize to present times, as being against the legalization of alcohol is an untenable position in 2014 New York City, but it is most akin to a law and order fever than was quick to blame poor Irish rather than today’s poor blacks and Latinos. By painting Tammany’s enemies in such an unfavorable light, the reader eventually wants to root for the rakish street boys who battled with them for control of New York. Golway lists the transition from Boss Tweed to “Honest John” Kelly as the key turning point in Tammany’s history. During the leadership of Kelly and his successor, Richard Croker, from 1872-1902, Tammany mastered a personalized social services delivery operation that even its detractors admit is missing from modern politics. From the leadership down through the 4,000 hyperlocal General Committeemen, Tammany was there for community members “who needed help paying the rent, whose son couldn’t make bail, whose widow had fallen on hard times.” In comparison to the City’s elite, who could craft policy for the “deserving poor” even while socially segregating from them, Tammany’s approach of neighborhood politics transcended ideology, and combined the best of grassroots organizing and top-down party politics. In an era when voter engagement is in crisis, there might be room to nostalgize ward heelers who knew their neighbors, found jobs for immigrants, gave the poor coal, pulled people out of jail and spread money throughout their districts like candy. It’s not a mystery why some of them were popular. But good patronage is not a sustainable form of government. Much of what Tammany stole from the public treasury when straight to the leaders’ pockets, and most lived lavishly. Even the money funneled into their districts or their favorite Catholic charities came at the expense of the rest of the City, especially blacks. In time, the ad hoc solutions ward heelers used to help people with their daily lives became the centerpieces of social and economic reforms that would bring these benefits to everyone. The surprise was that no group was more responsible for those reforms than Tammany. Silent Charlie Murphy. Courtesy of MediaMode. Tammany’s golden era was probably the first three decades of the 20th century, when the machine not only achieved great power, but actually put it to good use under the leadership of Silent Charlie Murphy. Required to evolve politically due to waves of non-Irish immigrants, the expansion of New York City to five boroughs (reducing the strength of Tammany’s Manhattan base), and the spread of social justice oriented thinking in the Catholic Church (Pope Pius XI essentially denounced the capitalism), Tammany matured with New York City. During this period, Tammany produced Al Smith, who created the blueprint for the New Deal in New York State a decade before Roosevelt, and Robert Wagner, the U.S. Senator who crafted groundbreaking labor legislation during the 1930s. 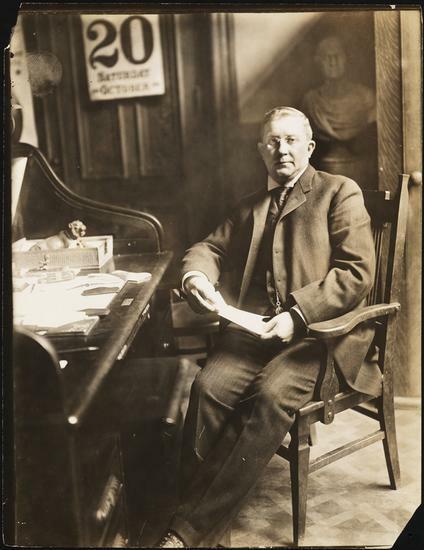 In 1911, Wagner assumed leadership of the State Senate, and Al Smith the State Assembly. (If only someone of his caliber was around to replace Sheldon Silver…) This legislature passed New York’s first mandatory workers’ compensation law, regulated child labor, shortened the work day, established a minimum wage in certain industries and created state college scholarships for poor high schoolers. The legislature even tried to reign in Wall Street, doubling the stock transfer tax, though that bill was vetoed. Smith also presided of the commission that investigated the tragic Triangle Shirtwaist Factory fire. We think of this as the Progressive Era, but New York’s actual legislative achievements were far-reaching for their time. After all, most of these issues were still aspirational when Teddy Roosevelt ran with them on the 1912 Bull Moose ticket. Golway takes great glee in pointing out that so-called reformers during this period were fixated on moral issues like whether baseball should be played on Sundays, though most reformers also supported the legislation listed above. 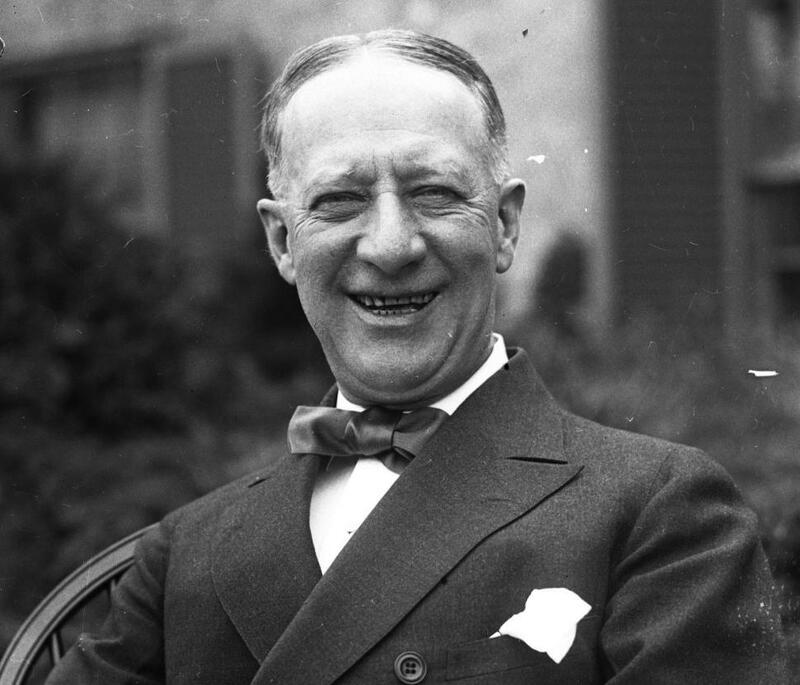 During Al Smith’s eight years as governor, he pushed through rent regulations, labor oversight, state ownership of bus transit and hydroelectric power and welfare programs for the poor, whether or not they were “deserving.” There is no question that Roosevelt used Smith’s programs as a template for the federal New Deal. Golway goes a little further, asserting that the wealthy Roosevelt learned his very compassion for poor people from Tammany’s philosophy. I am less convinced; some biographers attribute Roosevelt’s political evolution to the paralysis of his legs; his constant and painful rehabs put him into contact with many “regular people.” Whatever Roosevelt’s political and personal relationship with Tammany before he was elected governor, things soured quickly when he was forced to turn on him to maintain the clean profile he needed to run for president. Tammany’s demise was ugly, and Golway frames it masterfully by opening the book with a moment of triumph, a 4th of July party in 1929 where the entire New York State political establishment saw fit to pay its respects. From here, things fell apart both quickly and slowly. A corruption trial that puts today’s malfeasors to shame turned much of the City against Tammany (for an excellent account of this, read Once Upon a Time in New York), and Fiorello LaGuardia’s three straight mayoral wins shut them out of power through World War II. After the war, the machine carried on, but as an accessory to the criminal element, rather than the other way around. One of their last leaders, Carmine DeSapio, went down to a brash young West Village reformer named Ed Koch, in 1962. I am not sure if there are contemporary lessons to take from the Tammany machine. The bureaucracy of New York City government has become so impersonal that there probably is a role for a hyperlocal political operation that cares about all of its neighbors, not just the ones needed to win an Assembly race. That kind of support system takes a lot of money, and perhaps money for tenant lawyers, fixing playgrounds, and fighting rats would be of greater civic and political value than another round of campaign mailers. More study is needed about the Silent Charlie Murphy era, when Tammany appeared to master the political art of turning populist discontent into meaningful legislation, a combination that has eluded both major political parties for most of American history. What was it about leaders like Al Smith and Robert Wagner, and the currents of their time that made such change possible? Otherwise, I remain unconvinced by Golway’s revisionism. Pre-Murphy and post-Murphy (and frankly, plenty of what happened during the golden era) Tammany Hall represented a self-dealing concoction of bribes, hacks, cronies and financial mismanagement. Yes, the machine “made” men, but just as often the men they elevated would flee Tammany’s hold as soon as possible, like a pet that never really wanted to be caged. Tammany made a mockery of the state judicial system, which had to be rescued by lawyers forming the City Bar association. Nor can Tammany claim credit for building most of the City; while some of its ornate boondoggles like the Supreme Court building still hold up, great works like the Brooklyn Bridge were built in spite of Tammany, not because of them. There is no evidence that Tammany skimming money off the top or steering contracts to themselves and their friends did anything but hurt New York, and few wept at their demise during the mid-20th century. Though Golway may have given this legendary organization more credit than it deserved, his book does a good job capturing the personalities that ran it during its years in power, and was ultimately a fun read. Of course, Tammany was not the last political machine in New York City. Localized fiefdoms and patronage mills lasted well into the 1980s, when many were busted up by scandal and the probing investigations of U.S. Attorney Rudolph Giuliani. People still use the phrase “political machine” in reference to Queens, Brooklyn and the Bronx, but these operations are shells of their ancestors, peddling mostly in regional solidarity for internal battles like the City Council Speaker’s race and the upcoming Assembly Speaker’s race. The nominal head of the Bronx machine, Carl Heastie, is now a favorite to serve as the next Speaker of the Assembly, while Queens is propping Catherine Nolan and Brooklyn is pushing Joe Lentol. Like most machine leaders, Heastie is taciturn- by his own admission, his favorite phrase is “no comment.” Between now and February 10, the date of the special election for Speaker, we’ll be taking a look at how the Bronx political machine evolved, beginning with Ed Flynn, who used the lessons of Tammany to become an indispensable force within the Roosevelt administration. 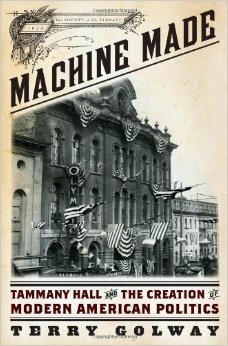 Terry Golway’s Machine Made: Tammany Hall and the Creation of Modern American Politics is published by Liveright Publishing Corporation (2014).